One of Nia’s magic toys! Floorplay. This is where we actually get on the floor and play. The most common comment I receive from people about floorplay is, “I don’t like to get down on the floor because I can’t get up.” And sadly that is the most important reason one SHOULD get on the floor is so that they can LEARN to get up. Even though most often with Floorplay we stay ON the floor, there is a time when we do get up. Floorplay is both Nia Class Cycle #6 and the Nia Blue Belt Principle #10. The tagline or second part of the principle is Movement on the Floor. Floorplay can bring up all kinds of fun stuff. It can bring up memories of infancy. With the scooting, the crawling, the getting up to walk, and the falling. It can bring up memories of childhood. Children often play on the floor. They do somersaults and gymnastic moves. They drive their cars around and roll and play. It is a fact of life that most adults lose their playful connection to the floor. Watch a group of children when they are told in a room to go play. The first thing most of them do is get down on the floor. They go to their knees and start to play. Most adults I know don’t ever think of the floor as a place to be. Floorplay allows us to reconnect to the earth. It allows us to reconnect to the ground. It allows us to sense gravity and the strength and energy of the earth. There is a pull that we can play with. There is the sense of falling that we can use. Floorplay is a way to explore. It is a safe place and a safe time to move and sense the body. Sometimes the floor can assist in a particular movement. The gravity can work to enable additional flexibility. It is truly a place of wonder to let go and move. Rolling around, letting limbs fall to the earth, pushing and pulling, stretching and yawning . . . . floorplay is a magical toy in the Nia toy box. It is a powerful time in the Nia workout for body, mind, and spirit. Floorplay in a Nia class can be a choreographed cycle or a FreeDance. Either way it is an important time to explore both The Body’s Way and Your Body’s Way. It is an opportunity to play with movement and to progress to your ideal. Even when the routine being done in class has choreographed Floorplay participants are free to do their own FreeDance. I often encourage my Nia students to do a “body check” asking their body what desires attention. If they want they are free to do what they need in order to give their body what it needs. Because most Nia routines include this cycle. It is recommended that Nia participants bring a mat to class in case they are more comfortable moving on a mat. A mat sometimes is exactly what is needed to ensure bone comfort and let the student move more freely on the floor. Most places I teach in San Jose have mats, sometimes there are just a few. The Nia Blue Belt reminds us that being on the floor is not just about static postures and stretches, it is truly about movement on the floor. That is why this cycle is called Floorplay and with the Blue Belt lens, the way we look at things, we are reminded to play and have fun. We are encouraged to use all of Nia’s 5 Sensations along with gravity and the energy from the earth to connect to the vertical, horizontal, and spiral and to connect with our bodies in a dance on the floor that we call Floorplay. So when is the last time you got on the floor and rolled around? When is the last time you got on the floor and played? What is stopping you? 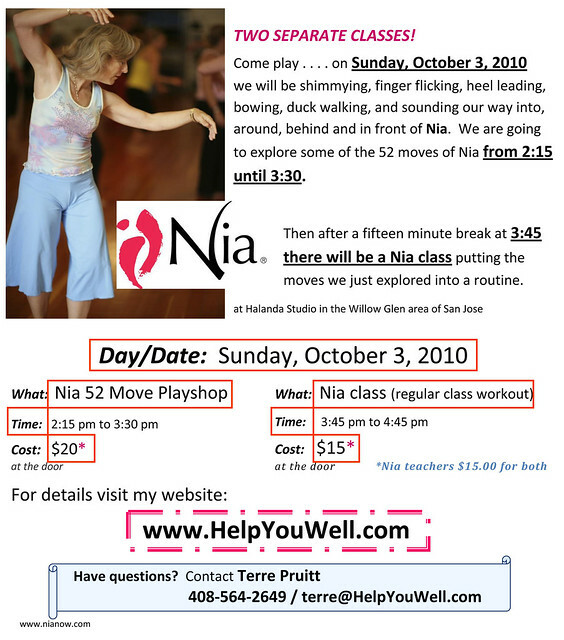 I have been teaching Nia in the San Francisco Bay Area for two and a half years. So far every Holiday that falls on one of my regularl class days, I have taught. I keep seeing postings on Facebook, Twitter, and other places on the internet about how classes are suspended or cancelled over the Holiday weekend. The classes will resume normal schedule on Tuesday. I understand this because some of the places where the classes are taught are closed over the three-day weekend. Also, a lot of people do go away during Holidays, but a lot of people stay home too. I find that because I have morning classes, my holiday classes are bigger. People that are normally at work get to come to a morning exercise class. I love it. I also understand that holidays are family time so it is nice to be with the family. Especially since most of the time people are having to get up and rush off on their separate ways. I am fortunate that my Monday and Wednesday classes in San Jose are at 9:00 am. Often times people can come take the class and be back with the family before the family is even up and ready to go about the day. AWESOME! It seems as if the actual independence day was July 2, 1776, when the actual legal separation from Great Britain occurred. The document clarifying and explaining what the meant was finalized on July 4th so it seems that was adopted as Independence Day. In 1938, Congress changed Independence Day to a paid federal holiday. This is all according to Wiki. I feel it is nice to take a moment to remember why we have a day off. Usually we are so excited by the fact we have an extra day to play we might forget why. I know I do. It really is my blog that helps me stop and remember. On Holidays I often look up them up to see if I should or could post about them. Today I decided to post a bit about it and about the fact that Help You Well / me has not taken a Holiday yet. I post the information on my site too, so that my students know I will be there and people looking for a class will know. Some people like to try a new class when they have the day off. I am fortunate to rent the studio where I teach on Monday so I am not subject to a “company” being open or closed. So I am there. You can find me at the studio in San Jose. Even though that is the one day when my hubby might be home and I have to get up and leave him, I am motivated by my students that show up that normally can’t attend on regular work days. Come join me. At the time of this post there is a Free Class pass on my site. Print it out. Use it. Come dance with us. Come celebrate freedom, barbeques, fireworks, picnics, and grilling. Yeah, dancing can be like that a celebration of it all. Come see.